It is one of our favorite times of the year. The weather is perfect, the good times are rolling, and music is in the air. Music Festival season is here! 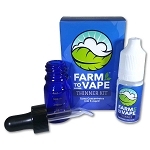 There is nothing better than a great concert with great friends, and no better traveling companion than Farm To Vape. Farm to Vape stickers are in!! Free sticker with every order!